Well, now that I finally have a few minutes to digest what just happened in Halifax, I will share my post-competition thoughts with you. 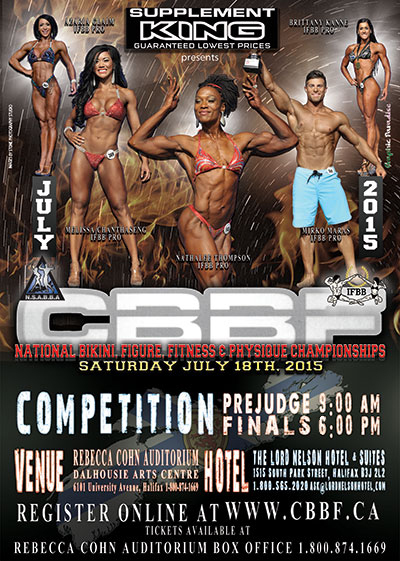 The 2015 CBBF Bikini, Figure, Fitness and Physique Championships just took place this past weekend, on July 18. 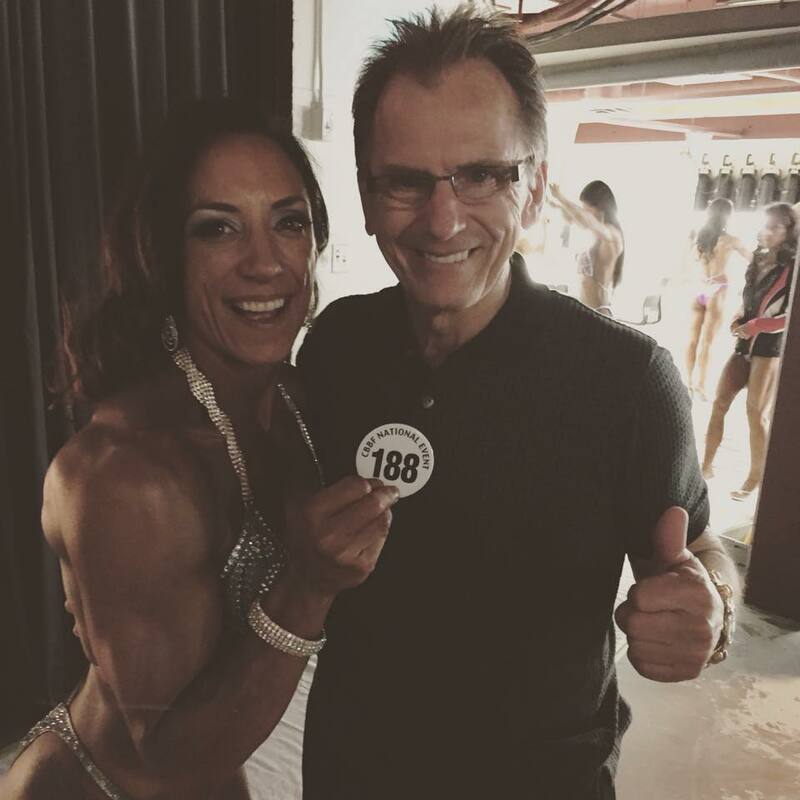 The best of the best from every province in Canada competed for the opportunity to obtain the much sought-after IFBB pro card in their respective divisions. This was my second attempt at it through the open stream, which simply means that this event was not drug tested. The natural nationals (tested event) is in August. I took a year off after qualifying at provincials before taking a crack at the national stage, instead of heading straight to nationals the same year. The decision was simple: the girls were much bigger at nationals, and I had some growing to do. I think that’s where a lot of competitors make their first mistake. Just because you dominated the provincial stage, doesn’t mean things will go as smoothly at nationals. There is no rush. Think about it, someone from a large province like Ontario competing against someone from a smaller province such as New Brunswick – obviously the Ontario stage will have way more competition. (Please don’t take offence if you’re from New Brunswick, I just chose that province based on population.) Not to mention, that competitor from the smaller province is up against someone who also had the opporutnity to compete at their choice of several regional shows, giving them way more experience to hone the all-important stage presence. No amount of posing practice in front of your bedroom mirror can compare to posing in front of a table of judges and an audience of strangers. But I digress… I took time off between shows to eat, grow and work out my game plan. I studied past national competitors and placings to get an “idea” of what judges were looking for. I say “idea” because no two shows are the same, and I’ve learned that you definitely can’t compare yourself to past IFBB pro card winners. All you can do is bring your best. Last year, I brought what was my best then to Edmonton. I had gained much more muscle than I had at provincials, improved my stage presence and posing, and had a better grasp of what worked for me during prep. 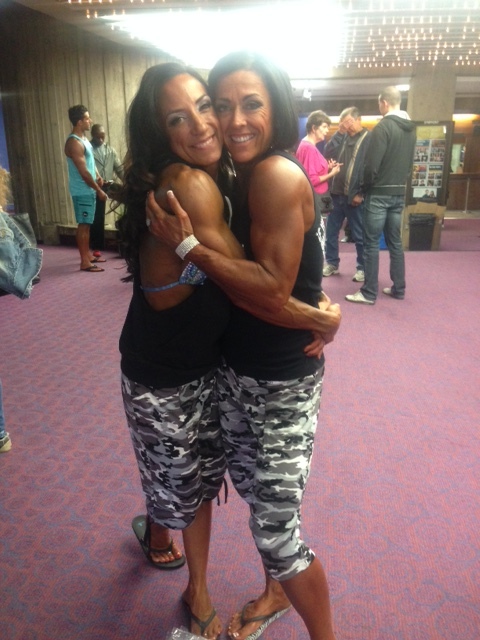 When all was said and done, I came away with 2nd place in both my open and masters categories. I had lost out of 1st place by 1 point. When I asked for feedback, I was told the shaved side of my head wasn’t feminine enough. Looking back at photos, I can also clearly see that my conditioning wasn’t as good as it could have been. My trouble areas, glutes and hamstring tie-in, still needed work. Needless to say, of course I was disappointed with 2nd place – always the bridesmaid, never the bride! 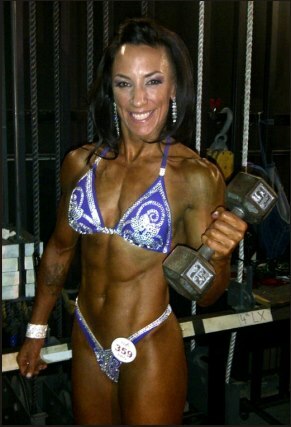 I entered national naturals in Winnipeg a month later where I placed 2nd in open and 6th in masters. That 6th place stung. A lot. 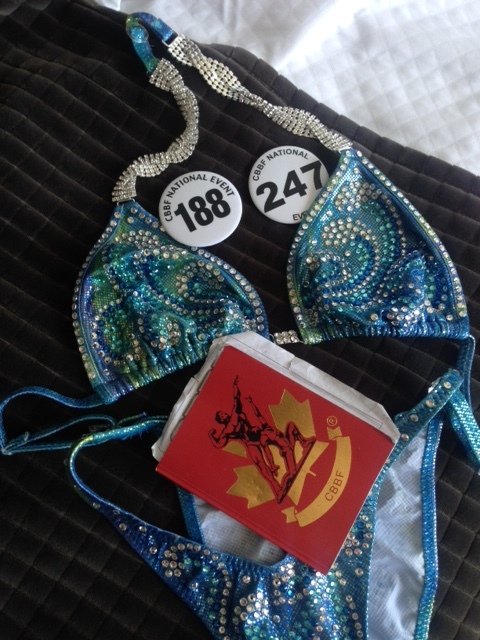 The boy always says that my conditioning comes in better for one show over the other – I guess Edmonton had the best of me, while I coasted into Winnineg. It’s not easy for any competitor to do two shows back to back like that. Which brings me back to my first point of taking some time off between provincials and nationals. Instead of wallowing in self-pity, I took that energy out in the gym. I spent the next year carving out my hams, glutes, and growing in my side shave! I was more determined than ever to show those judges that I deserved to be on that stage. My off-season wasn’t without its struggles. I had to deal with medical issues and root canals, which kept me out of the gym. The key to success in the world of competition is consistency, something I struggled with towards the end of last year. I changed positions at work, which had me working 15 hour days. All the while, still having to get in for morning fasted cardios, with a second gym session of weight training later in the day. My relationship became non-existent, and never mind having time for friends and family. They were sacrifices I had to make. I wanted that IFBB pro card more than anything. It consumed me and was pretty much the first thing I thought of when I woke up, and the last thing I thought of before going to sleep. A general starting point for most athlete’s competition prep is around 16 weeks out, that’s when they start tightening up their meals, and really putting their all into their gym time. Because I know my body, I start my prep around 22 to 26 weeks out. I avoid social situations where I will be tempted to eat or drink anything that isn’t on my plan, and basically become boring. I obsess over food, and weigh myself at the same time every day. To most I know that sounds unhealthy but, for me, it just works. I don’t become crazy girl or anything (although the boy may disagree with that statement), I just start to really focus on my goal: the IFBB pro card. Don’t get me wrong, and I’ll be honest here, I do not stick to my plan 100%. I cave into pre-menstrual sweet or savoury cravings, but I don’t go off the rails. I will diverge slightly, then get myself back on course. I don’t have all-out cheat meals, but I may give in to a swedish berry – or two. But that’s only because I start so far out. At around 3-4 weeks out, I stick to my plan. As I pointed out in my post The Cost of Competing, it’s not a cheap sport. Fortunately, Colleen McConnell, the talent behind The Crystal Suit, is a special kind of person, and I’m lucky enough to call her my friend. Our relationship began during regionals in 2012, when I bought my first suit from her. Colleen listened to my input, turned my ideas into reality and made me my this beauty. A few months later, Colleen approached me and asked if I would like to be a sponsored athlete. Would I??? And get to wear more of these creations??? You bet! We collaborated and came up with this suit for provincials a year later. This was the first competition that Colleen had little input from me. In the past we would throw ideas back and forth, but for nationals this year, all I did was pick out the material and tell her I wanted it wave-themed to match my nautical themed tattoo sleeve. On the Saturday, a week before the competition, I picked it up. Yet another stunning creation. I was already a winner. This year my coach, Sean Tierney, and I did things a little different. We tried to get me show ready a couple of weeks out, so that I could coast into peak week. Unfortunately, my body didn’t want to co-operate fully, and I was putting in fasted cardios 4-5 mornings a week, while weight training 6 days a week, followed by post-workout cardio right up until, and at the start of, peak week. That’s what worked for me. For someone else, that may end up working against them, causing their metabolism to shut down. That’s why it’s important to take your time with each prep and off-season, and really listen to your body. On the Saturday before peak week something happened. 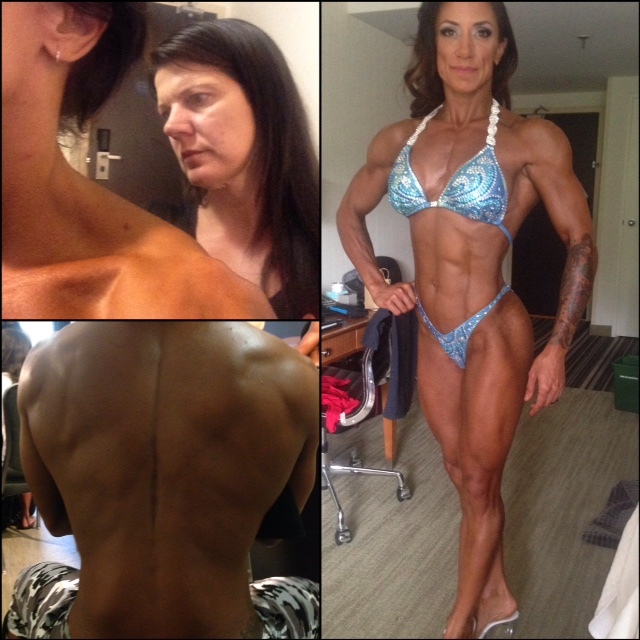 I was looking the best I had ever looked at this stage before competition, with striations in my quads (!?!?) when my body decided to sabotage itself. I gained 8lbs overnight. I panicked. I didn’t know what happened or why. Then, it became clear, (cover your eyes boys) I started my period. Disaster, or blessing in disguise? At least it would be finished by the time I hit the stage, but I was worried I wouldn’t be able to flush out all that water retention. Side note: I have never lost my period during a competition prep. I had a slight scare coming through customs… The baggage checker at security thought she’d be funny and told me my food wasn’t allowed on the flight. I had all my pre-made, pre-packed frozen meals in my carry-on. Everything. I nearly lost it on her. Everyone knows you don’t mess with a competitors meals – especially when they’re carb-deprived. Well, everyone at customs thought it was so funny, and I still didn’t catch on that she was joking. Food is not a joking matter. Eventually my bag was waved through, and I finally saw the funny side of it. Sort of. The boy and I arrived in Halifax on Thursday, two days before competition. I was on 9 litres of water that day and spent the majority of the flight in the washroom. I’ve always said that the best part of competing is making new friends and meeting up with old ones. Well, I met a couple of competitors, Ella Proksch and Syndy Bennett, on the flight and had a chance to hang and chat with them again backstage. The water was doing its work, and I was starting to flush out all that water I was retaining. But I still wasn’t where I was before my period started. We got settled at the hotel and I got my feet up while the boy went out to explore the city. Friday was registration day. 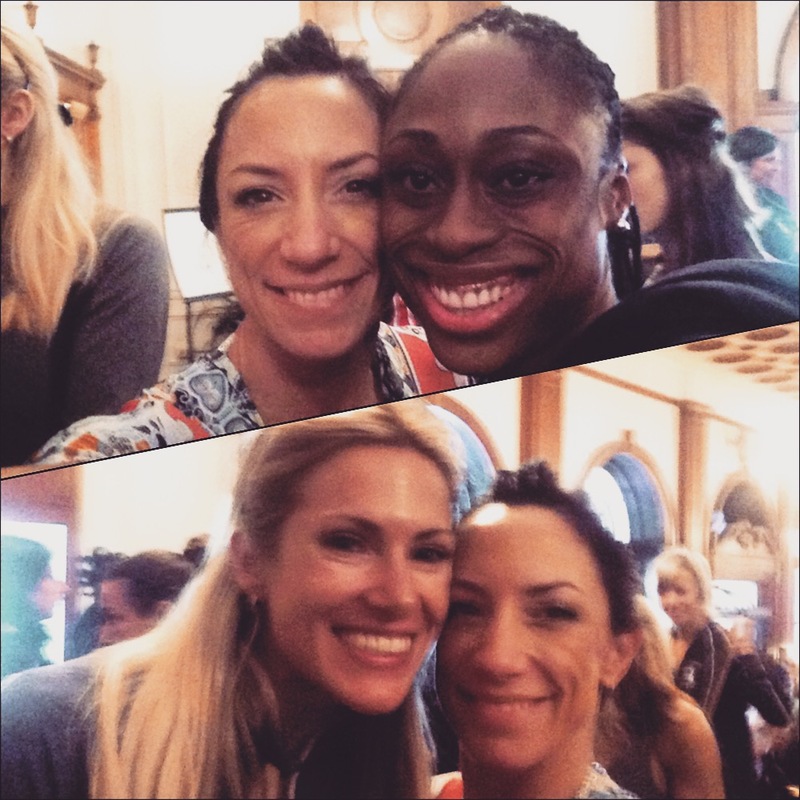 I found a couple of friends, and fellow Ontario competitors in line, Jill Bunny and Alethia Legall-Gabriel. We were measured and had our suits checked by the head judge, Debbie Karpenko. There were a few girls who didn’t pass her stringent check, and had to scramble for a back up suit. TOP TIP: always bring an extra suit and shoes to registration. I got my competitor numbers:188 for the masters class, and 247 for the open, and headed back up to my room for my final check-in with coach. Sean was pleased with how I was looking and advised me to keep on our plan as outlined. No crazy cheat meal, no last minute tweaks. Happy coach, happy client. All that was left to do was to walk out on stage. I headed over to Absolute Touch to get tanned Friday night. During my off-season I was approached by them and asked if I would like to be sponsored. What a freaking honour! I truly am humbled by the opportunitties and friendships competing has afforded me. As anyone that knows me knows, me and tanning have a love-hate relationship. It’s the worst part of competing for me. I don’t dry easily and, up until I found Absolute Touch, I have had some pretty horrendous competition tan disasters. Honestly folks, make your prep less complicated and get the whole stage package – hair, makeup and tan. It takes away so much stress. I was dry in under an hour and back in my room with my feet up. This competition felt different from others in the past. I wasn’t nervous. I had this inner sort of calm I hadn’t experienced before. Thinking back on it now, it’s because I was prepared. As they say, “fail to prepare, prepare to fail”. I was ready. I had already beat my last year self. This was my best me. I was up early for a second coat of tan, hair styling, makeup application and got my tattoo covered up. Pam Bortmes of Absolute Touch has an amazing talent and attention to detail. Her team of artists are talented too, and so much fun to be around. They really made me feel relaxed and confident that they were making me look my best. I was relaxed backstage. Calm. I felt ready. My first class was Figure Masters B, where I was up against 7 beauties. We were called out onto stage as one group. I was moved to the centre position, and remained there through our quarter turns. No time to waste, next up was my Figure Open C, in a class of 13 women. Again, we were called out onto stage, split into two groups. I made first callout and didn’t move from centre spot, other than two switch sides so that the judges could get a different perspective. Now, all that was left to do was hold onto my conditioning while I awaited the night show. I was confident I had placed well, but there’s always that lingering feeling that the carpet could be pulled out from under you and you place lower than expected. My TOP TIP for any competitor: be humble. Don’t expect to win anything. Go into your competition with composure and humility. Be gracious and thankful that you are even able to stand on that stage. You don’t deserve anything. Be confident knowing that you worked your hardest to be there, and be satisfied with that. Anything else, trophies, etc. is just icing on the cake! 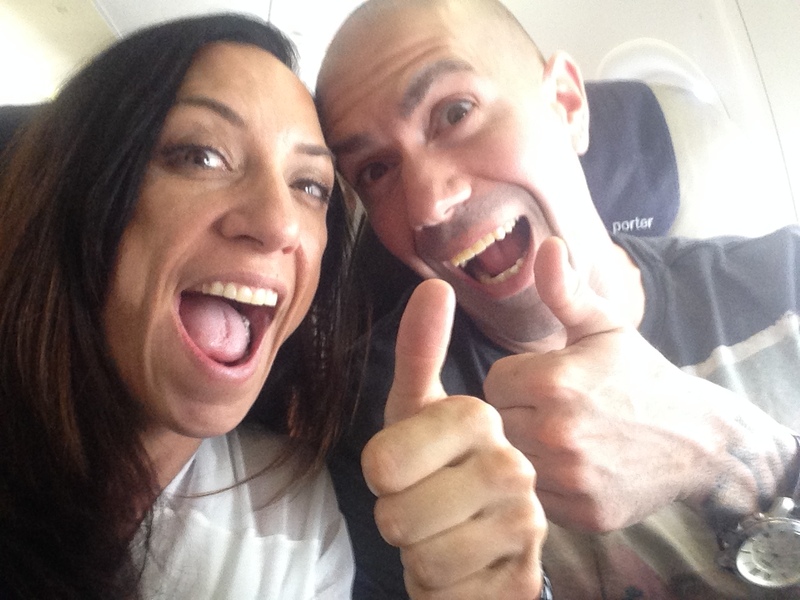 I had my final check-in/panic with coach – I was worried I had spilled over and was starting to hold water. I didn’t think I looked as dry as I had in the morning. Sean told me I was crazy, and I chilled until my class was called. I won! I freaking won!!! Thanks to David Aboody for the stage shot. I went on to win my Open class too. I was on a high and prepared to go home with that. I was satisfied that I had accomplished what I set out to do this year; improve on last year. I wasn’t expecting to win an IFBB Pro Card. All the winners from the masters height classes were called onto stage for the overall, this also included my good friend (and sister from another mister) Judy Doughty, who won the grand masters division. There were six 1st place winners competing for one IFBB pro card. The overall was awarded to B.C.’s Tanya Chartrand. I was so happy for her! I didn’t feel at all let down. I had already won. But then something happened. 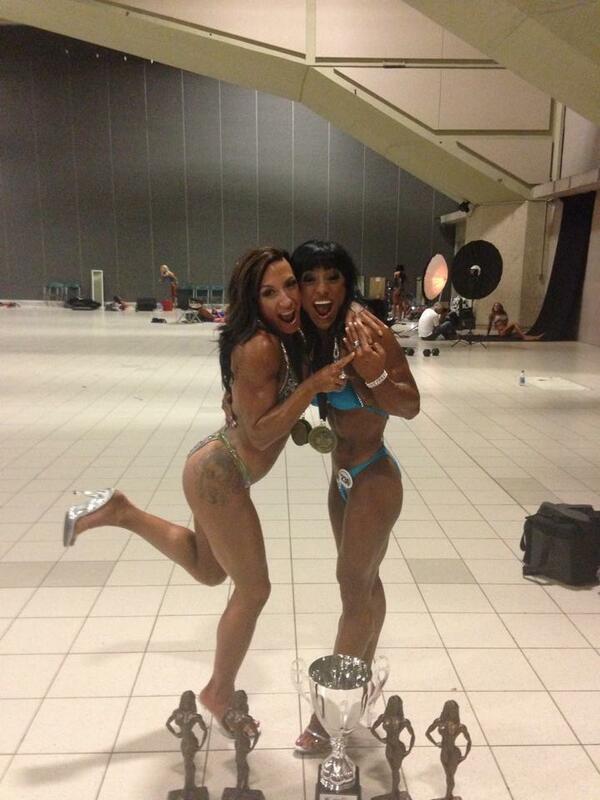 They announced they were awarding a second pro card and called competitor 188 back onto the stage – that was me!! 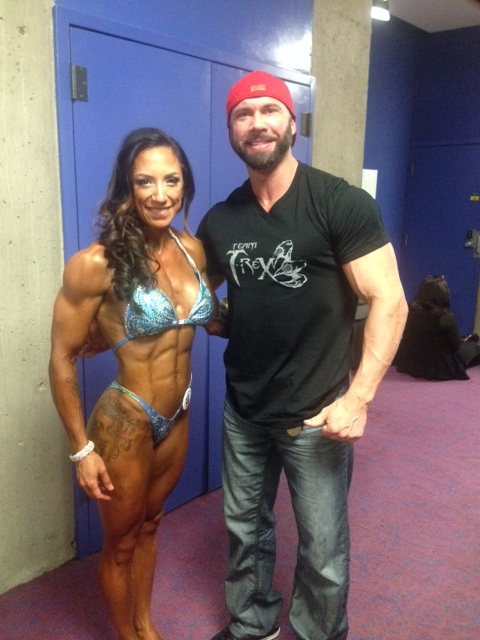 I had a backstage photo op with the President of the Ontario Physique Association, Ron Hache. I had to quickly change numbers and head back out onto stage for the Open Overall presentation. 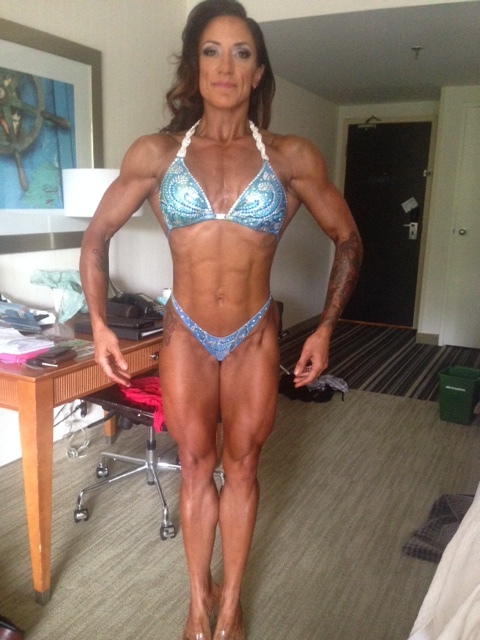 Another Ontario IFBB pro card! This time, awarded to Melissa Bumstead. What a fantastic turn out for Ontario athletes and the OPA! Competing isn’t for everyone. You have to really weigh what your goals are versus reality. Can you sacrafice a summer spent drinking beer on the patio with friends and family for the gym? Do your loved ones understand what your goals are and support what you’re doing? How bad do you really want it? I’ve been sleep deprived and hungry, paranoid and have dealt with a lot of self-doubt. Every year for the last three years I have competed in the summer, which means I’ve missed going out for food and drinks with the boy on his birthday. I feel awful about it, but he’s never made me feel bad and never complained. Will I continue to reach for the top? Absolutely! What’s next? Well, I promised my figure wifey, Sueling Yip, that we would compete at a pro show together. 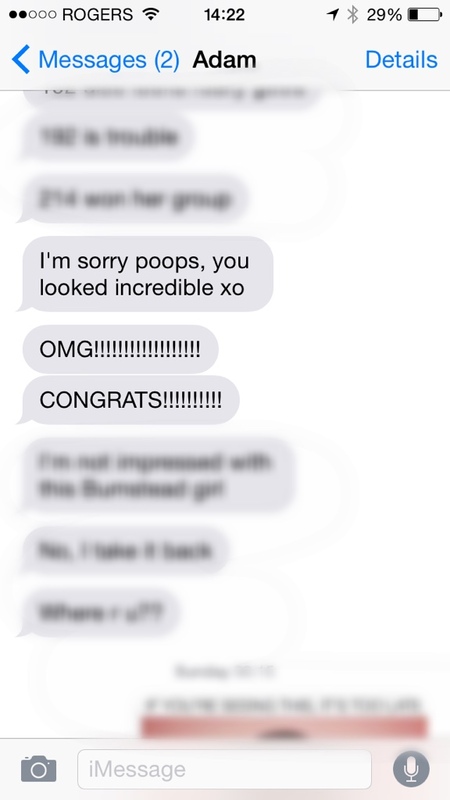 Ahhhh… Thanks Alethia! Can’t wait to see what you bring to North Americans!